The election was held on 19 December, 1931. The Great Depression was at its height and dominated the election campaign. A fall in the prices for Australian commodities meant difficulties in meeting interest payments on loans to Great Britain. Both federal and state governments came up with the ‘Premiers’ Plan’ to reduce spending. Dissent over the plan resulted in Joseph Lyons leaving the Labor Party. Lyons formed a new party, the United Australian Party with the Nationalists. The change in numbers meant Scullin had no choice but to go to an election. All three leaders of the major parties broadcast their policy speeches on radio for the first time. The election result was a landslide to the non-Labor parties, with Joseph Lyons becoming the first United Australia Party prime minister. The United Australia Party had won 40 seats, the Country Party 16 seats and Labor 15 seats. Key issues were employment, wages and fiscal management. James Henry Scullin was born 15 September, 1876 and died 25 August, 1967. Scullin was Prime Minister of Australia 22 October, 1929 to 6 January, 1932. He was the leader of the Australian Labor Party. 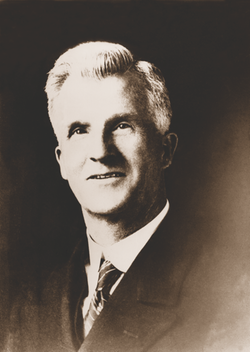 Scullin represented the electorates Corangamite, Vic 1910 to 1913 and Yarra, Vic 1922 to 1949. After two years of office the Government comes before you asking for an impartial examination of the work it has done, and, on that, to judge accordingly. I make no other appeal. I ask that the people of Australia shall choose wisely by considering only the welfare of our country. The times are too critical to allow any but the highest considerations to weigh in making a choice. I propose to place before you the Government’s outstanding achievements and to outline the problems which still require solution. Though handicapped by a hostile Senate, with no money in the Treasury, but on the contrary, a heavy deficit, we kept public services going, avoided default, maintained the nation’s honour, and are now confident that the crisis has passed, and that Australia is on the road to recovery. The Government was defeated on the most paltry question that has ever brought about the overthrow of a Ministry. It has no substance and is not worth of the slightest consideration by the electors in deciding national affairs. Such was the weapons however, which was seized upon with avidity, by our opponents to bring about the defeat of a Government – a Government that had shouldered the nation’s burden, steered it through grave economic perils, and was intent on the work of reconstruction. It is for the people to judge their actions and their motives. It is universally admitted that no Australian Government ever faced such a black financial outlook as did the present Federal Government. When it assumed office in 1929 it inherited a host of difficulties from its predecessors, including an appalling adverse trade balance, a huge deficit, falling revenue, and increasing expenditure and growing unemployment. Loans at the rate of £30,000,000 a year had been raised abroad, and came to Australia in the form of goods. The adverse trade balance for seven years was £92,000,000. The rectification of this position was the first task of the Government. It increased tariff duties, prohibited many imports, and encouraged home production. As a result, imports were reduced from £140,000,000 to £45,000,000 and an adverse trade balance of £32,000,000 in 1929-30 will this year, be converted into a favourable balance of £30,000,000 – an amount sufficient to meet the annual overseas commitments of all Australian Governments. The stoppage of the flood of imports reduced customs revenue by £14,000,000. The full effect of the frenzied finance of the previous Government was made manifest in the results for 1930–31, when despite our economies and new taxation, there was a deficit of £10,000,000, with a prospective deficit for the present year of £20,000,000. In view of that prospect the banks refused further assistance, and national insolvency was imminent. Drastic measures were necessary to retrieve the position. A plan of financial rehabilitation was evolved, which embraced a reduction of internal interest by a scheme of debt conversion; a reduction of Government expenditure; an increase in taxation, and a decrease in bank rates of interest. As a result of these measures, the improvement to the Commonwealth Budget for 1931–32 was £15,000,000. In addition, the Commonwealth has been temporarily relieved of the charges in respect of war indebtedness to the British Government. There are now bright prospects of actually balancing the Budget this year. Remembering the tremendous and unprecedented difficulties which were encountered when the Government took office, this truly is a wonderful achievement. The sacrifices imposed under the emergency legislation were necessary to meet the serious financial crisis, which had arisen in Australia. When it is felt that the financial position is secure, steps will be taken towards restoration. It was with great reluctance that the Government reviewed salaries and pensions but, as I pointed out at the time, had the reduction in expenditure not been made the banks would have refused further advances to meet deficits. Rationing of the revenue would have been imperative. That would have provided only 13/ in the pound to meet all obligations. For example, pensioners would have obtained 12/ per week instead of 17/6 which they are now receiving. Present indications entitle us to believe that the financial position will be considerably improved. If the improvement continues there will be an early restoration of pensions and wage standards. The Nationalists and Country parties, composed of pseudo-protectionists and rank free-traders, have bitterly assailed the Government’s tariff policy–a policy designed to save the nation from collapse and to give protection to Australian industries against the dumping activities of keen overseas competitors, who found it impossible to sell in their own depressed markets. But for this protection Australia would have suffered double injury. The fall in world prices not only affected the value of our exports but it enabled outside countries to dump their manufactured goods into Australia. Already the Senate, in the last few days, has shown what havoc it would have worked on the tariff schedule before it had completed its deliberations. Out of eighteen items dealt with by the Senate, it carried substantial reductions in thirteen items. Among the motives which moved the Opposition to defeat the Government was the destruction of the tariff. It is clear that if the Opposition attains office they will undoubtedly make even greater reductions in the tariff than they would on the eve of an election. Already manufactures overseas are showing their hand. They know only too well how the tariff policy of the Bruce-Page Government suited their interests. The imports into Australia during that regime were £140,000,000 a year while Australian factories were closing down and thousands of Australian workers were rendered idle. The hope of overseas manufactures for the return of the Nationalist and Country parties should be taken as a warning by the electors who desire to build up Australian industries for the Australian people. I do not propose to enumerate a lengthy list of legislative proposals for the coming Parliament, nor do I intend to indulge in lavish promises. The next Parliament must concentrate on the work of economic reconstruction. During the next three years, Australia, in common with other countries, will need to grapple with serious economic problems. The effects of the worldwide depression will not vanish magically in a night. The work of the Government during the past two years has been hard. For many months a financial collapse was imminent. That dark cloud has now been lifted by the people’s acceptance of all-round sacrifice. Financing the nation’s welfare before political interests, the Government has not only rectified the adverse trade balance, but has straightened out its finances so successfully that from an estimated £20,000,000 deficit we are now contemplating a balanced budget. The main purpose in these two years was to starve off disaster. Every effort was made to save the ship of State from crashing on the rocks. There was, therefore, no opportunity to make progress. It must be evident to every thinking person that that is but the beginning of the task. The work of reconstruction has to be faced. Gradually that which the nation and its people have lost can, and will be restored. We must bring together the best brains of public spirited men in all walks of life to advise and assist in the work of reconstruction. Industrial leaders, representing employers and employees, financial and economic experts, Commonwealth and State Governments and other governing bodies must co-operate and concentrate in settling the most serious question of all–unemployment. If the nation does not settle that problem, that problem will settle the nation. It is a mere commonplace to say that Australia is rich in natural resources. Rich as are these resources, great as is the capacity for the production of wealth, we have 300,000 unemployed, many of them suffering severe privation. A simple question might be asked of those who are in control–whether it be of Parliaments or of industry, or of financial institutions–why is it that the people who are willing to work cannot utilise the lands and the forests and the minerals and produce for themselves food, clothing, and shelter and all other requirements? How is it that machinery ably fashioned by the hand of man is now standing idle? It is not the power of production that has failed, it is not that droughts or pests that have prevented production, it is not that human labour has grown slack and unable to perform its ordinary functions, it is not that there is no potential consumption for these goods. The only answer given to this question is that there is no money available to set the wheels of industry in motion. We have the machinery, the plant, and the manpower but we are told that we have not what might be regarded as the lubricating oil. The greatest financial experts agree that the monetary system all over the world has failed to meet the rapid progress in the means of production. The capacity to produce has gone ahead by leaps and bounds. The means of distribution have lagged behind. Already those in responsible positions in the financial world are searching round for remedies. That the ultimate financial solution will be found in international financial co-operation is generally accepted. We must ourselves however, endeavour to apply remedies and take steps towards the solution of our own internal troubles. The Government will co-operate with the government of Great Britain not only on the question of interchange of preference and mutual arrangements for markets, but will also co-operate with Britain and the dominions in seeking for a sounder monetary system. It will go further, and cooperate through these channels with all nations. In the meantime we cannot allow our people to suffer want. The necessity to restore employment and rehabilitate trade and industry within our Commonwealth is the paramount issue which dwarfs every other issue in this time of crisis. It is within the capacity of the Commonwealth to provide work and a livelihood for every citizen without defaulting on any of its obligations at home or abroad. No country is so well circumstanced as Australia in the present economic cataclysm to provide work and sustenance for its population. The productive powers of our land and pastures, the vast wealth of raw materials and natural resources, our transportation, wharves, and factory equipment, all these are in excellent condition. They need however, the application of intelligent mechanism, of exchange and distribution to enable industry to function for the workless. That industries are producing today more foodstuffs and commodities than they can dispose of is the result not of reduced needs of the consuming public, but of the disorganisation, and to a large extent the collapse of the monetary system. That has caused millions of pounds of purchasing power to vanish and deprived the whole community of adequate means of payment. This in turn, has resulted in reduced widespread unemployment and a constantly diminishing national payroll, which reacts again and again in increasing the intensity of depression. The Government will be accused in this election campaign of all kinds of wild-cat inflationary proposals. I ask you to disregard them. These things were said when the Fisher Labor Government established the Commonwealth Bank, and introduced the Australian notes. The notes were sneered at as ‘Fisher’s flimsies.’ It was predicted that a one-pound note would be sold at the street corners for 5/, that the bank would be a failure and would lose many millions of pounds. None of these predictions were fulfilled. We are proposing that the Commonwealth Bank shall be restored to its original position in which it was placed by the Fisher Government. Under the governor and his deputies it started from comparatively nothing and became an important and valuable institution in Australia. It can make greater progress in the future under similar management. National interests and public welfare alone shall direct its operations. There need be no fear of political interference with its business. There was no political influence on the late Sir Denison Miller when he was the governor and controlling power of the bank. To free the Commonwealth Bank, so as to compete actively as a trading bank with other trading banks, it is proposed that it shall be relieved of the measure of central banking business that it is not performing. The Commonwealth Bank was intended to be a trading institution and to operate freely in competition with the private trading banks. In the course of its development, branches were opened in different parts of the Commonwealth and it carried its business far and wide in competition with the private trading banks. It was only later in its career that it assumed central banking functions. Originally the bank had not even control of the note issue. Subsequently it was given that control and an attempt was made to convert it into a central reserve bank only. The Central Reserve Bank Bill that was rejected by the Senate will be again brought forward. Under that bill it is proposed to establish an important financial institution to operate for the maintenance of the stability and security of Australia’s monetary and credit system. The extension of central reserve banking is a notable feature of the financial developments in many countries in the world during the last ten years. A central bank can aid greatly in tiding a country over a period of financial stringency and credit difficulties. By mobilizing and concentrating the reserves of all the banks in the central bank they can be used to the best advantage and the community as a whole would benefit. Without weakening these reserves, increased bank credits could in that way be made available to industry. That would set the wheels in motion. The cumulative effect would be that expansion of one industry would lead to the extension of another. To give an impetus to the movement to increase employment the Federal and State Governments, through Loan Council, unanimously asked the banks to make advances for new Public works. That proposal will be persevered with. The response by public bodies and employers to the appeal to give employment, encourages the belief that greater co-operation for a permanent solution of the unemployment problem can be obtained. What has been done is but a preliminary. Employers will watch its effect upon their own business. The Government is watching its effect on revenues. There is no doubt that beneficial results must follow to trade, commerce, and Government finance by every increase in the number of employed. Employers and Governments must follow up this beginning so that further and more substantial efforts shall be made to provide work for the unemployed. One of the important questions to be dealt with very soon is that of preferential trade. The Government’s policy is first to encourage and support Australian manufacture, and, secondly, to secure British industry the largest possible share of the import trade of the Commonwealth. Britain, at present, gives Australia preference on a very limited number of products. An extension of preferential trade would help Australia by securing for our products a larger share of the British market. Australia, in return, could purchase from Britain a larger proportion of the goods which we find it necessary to import. The opening up of markets and better organisation overseas will be the means of absorbing many thousands of our unemployed. The great hope for Australia in the future lies in the intensive cultivation of the land. We have railways and roads constructed through large areas. And much of that land has an assured rainfall. The foundation of the nation’s prosperity is the land, and on that foundation can be built secondary industries, each industry, primary and secondary, being complementary to the other. The high rate of exchange is costing the Governments of Australia many millions of pounds for the transmission of moneys to meet our overseas obligations, but that exchange is equivalent to a 30 per cent bonus on the export of our products. It is assisting to build up and strengthen our primary industries, to support the man on the land, and to encourage others to take up rural pursuits. The Government favours the maintenance of the existing exchange. This is a form of protection, by subsidy, of primary industry and with the tariff protection for secondary industries will give Australians a diversity of employment with a more equitable balance between city and country interests. The last election was fought to save Federal arbitration from destruction. The Bruce-Page Government set out to repeal the Arbitration Act. Defeated in their designs by the electors, the Opposition used their majority in the Senate to frustrate the Labour Government’s efforts to carry out the will of the people. That the Arbitration Act required amendment has been demonstrated on many occasions. An amending bill introduced by this Government was drastically altered in the Senate. The validity of certain clauses in the amended Act providing for conciliation committees was challenged in the High Court. The court held they were ultra vires. An amending bill to overcome these legal technicalities was passed by the House of Representatives but was rejected by the Senate. Arbitration is the only sound means for the settlement of industrial disputes. It has opponents amongst the extremists – Conservatives and Communists. These are united in hostility to arbitration. Admittedly the machinery is not by any means perfect. The legislation is somewhat faulty, but the principle is sound. With a majority in both Houses of Parliament, the Government could do much to improve the legislation and administration of conciliation and arbitration. Having sponsored arbitration, the Labour party desires to see it perfected, and will resist to the utmost any attempt to destroy that basic principle of Labour’s policy. The cost of living figures upon which the basic wage is now calculated have been questioned in many quarters, and in order to remove any misgivings or any anomalies that exist the Government decided recently to authorise an inquiry into the methods of arriving at the basic wage. This investigation will be proceeded with immediately after the election. The Government had hoped to place before the people amongst other Constitutional questions proposals to grant the Commonwealth full industrial powers to enable Parliament to pass a comprehensive arbitration law. As a result of the defeat of the Government, the proposals to amend the Constitution cannot be referred to the people at this election. There still remains however the need for alterations to the Constitution. When the important work immediately confronting us has been dealt with attention will be given to the question of submitting Constitutional amendments to the people. There will, of course, be other legislation of minor importance, but in this election we should concentrate our thoughts on the vital question of unemployment. That one word, unemployment, embraces practically the whole of the economic and financial problems. The maintenance of effective tariff protection will play such an important part to the solution of unemployment that every attack on the tariff must be regarded as a hindrance to the absorption of the unemployed. If the flood gates are again opened to importations, if our industries are again to be crushed by outside competition, every effort made for the unemployed will be nullified. We must determine to hold what we have on the vital question of protection and push forward with organised plans, so that the fullest advantage may be taken of the protectionists’ policy. There is need for better organisation by Governments, local governing bodies, banks, private employers and the general body of workers. If the nation were called upon to organise to resist invasion it could do so. It is now called upon to provide work for an army of 300,000 unemployed. Neither inflation nor deflation will provide an effective solution. The purchasing power of the people must correspond more closely to their producing power. How far we can go in a practical way to bring that about can only be tested by earnest inquiry and strenuous effort. Governments, economists, bankers and others came together to evolve a plan to balance budgets. That plan covered a wide field. All sections must co-operate and concentrate on the next, and more important, steps of providing the means by which the people shall get work. While the Government was patiently unravelling the tangled financial skein, and working for a revival in industry, opponents were careering round the country spreading party propaganda and rendering the task of the Government more difficult. Newspapers with a few notable exceptions, hurled criticism and invective against the Government. Abusive epithets were applied to me personally because I determined to maintain allegiance to the party to which I am pledged. The formation of a Coalition Government in Britain was thrust forward as an example. The Coalition Government in Britain, however is now only setting out to balance trade and balance the Budget. The Labour Government has successfully done both these things and preserved its political identity. On election day you have to decide between the Opposition and the Government. What guarantee have you that the combination of Opposition forces would not carry out their former intention to destroy Federal arbitration? What undertaking do they give that they would not pull down the tariff wall to its former level and expose Australian industries to ruthless competition? The question you must ask yourself is: Will you support those who spent borrowed money extravagantly, encouraged imports, and brought the country to the brink of ruin? Or will you support the Government which by quick, bold and drastic action converted an excess of imports into an excess of exports and stopped the drift in time to prevent a national calamity. You have an important decision to make. You many elect those who left behind them financial chaos, or return the present Government, which restored and will maintain sound national finance. There should be little difficulty in arriving at a decision.